This oceanfront studio apartment located at Stella Maris condominium in El Condado District of San Juan is tastefully decorated and furnished throughout with all amenities. 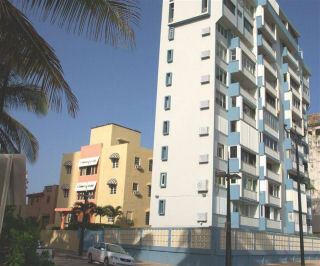 Stella Maris is next to the Marriot hotel and within 10 minutes drive from San Juan airport. This fourth floor studio apartment is very spacious, with air conditioning, and an ocean facing balcony for relaxing and enjoying the views and action. A studio apartment with fully equipped kitchen, queen size pull down Murphy bed, Air conditioning, Cable TV w/VCR and Stereo CD player, phone (local calls only), all bed linens, laundry room on the ground floor of the building (coin operated), large sliding doors that open to ocean facing balcony, located in the popular El Condado tourist district of San Juan, Puerto Rico. 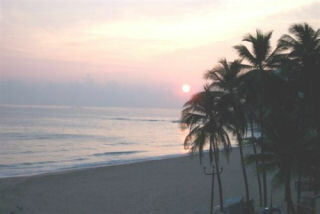 This caribbean vacation rental apartment, with available maid service, is located on the beautiful Condado Beach. Offering panoramic views of the Condado Beach and Fort Geronimo. The beach is a very popular white and golden sandy beach suitable for sun bathing, swimming, wind surfing, and other water activities. El Condado is San Juan's most popular tourist district offering plenty of restaurants, shopping, proximity to major resort hotels such as The Caribe Hilton, the Mariott, Condado Plaza and other popular hotels. Relax in your very own apartment after your cruise or extended business conference.